Aston Barclay has announced plans to invest £1m into its Chelmsford auction site this year, increasing capacity and introducing a twin turntable inspection bay. The £1m investment will improve vehicle workflow and ultimately expand vendor volumes. The move, which will ultimately enable the firm to grow vendor volumes, will see the 12-acre site transformed to streamline work across all areas of vehicle preparation, inspection, sale and logistics. A new entrance for car transporters built on the north-west side of the site close to the new inspection facility will increase efficiencies. Cars will be unloaded, washed and then imaged using two new turntables featuring SpinCar technology, which enables buyers to closely examine the car’s interior and exterior condition online. The turntable technology is already in use at Aston Barclay’s Prees Heath, Leeds and Westbury sites but this is the first time the firm has deployed the twin turntables at its centres. The improved site flow will provide an additional 160 extra parking spaces and reduces the amount of times cars are moved while on site. 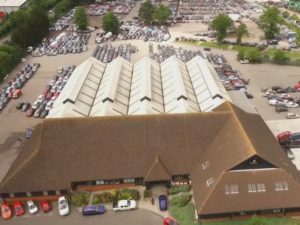 The site’s two auction halls – which host six sales per week, including a fleet and leasing event on Mondays – will be retained.